Recently I devoured the most exquisite yet enchanting book, Blood Brothers. It is the fourth book in the series ‘Dragonkeeper’. It tells the story of a monk named Tao. He is the only monk in his family for one reason. He is accumulating good karma for his brother Wei. His brother Wei is unable to move his limbs or talk, but Wei has the powers of a dragonkeeper. When Tao and Wei hold hands, some of the powers are transferred to Tao, as Wei cannot use them. Tao can then talk to a dragon that was following him throughout his journey so far. Kai the dragon is in search of a dragonkeeper. As Tao journeys on from his house, he comes face to face with some terrible bloodthirsty nomads. Will Tao escape? Can Wei survive? I believe the title is very suitable for this story and you will understand it when you finish the book. Blood Brothers is very hard to put down. I experienced the feelings with the character as if I were in his shoes—sad, relieved, excited and worried. This book is recommended for ages 9 and above. My favourite part was when Tao called Wei ‘Wei-Wei’. I would rate this book all the stars visible in the night sky. Now I’m going back to read books 1, 2 and 3! 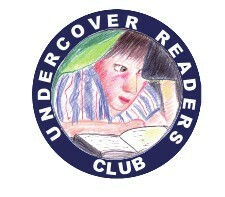 * Celine is a member of our Undercover Readers Club. (Download information about the club on the magazine’s website.) 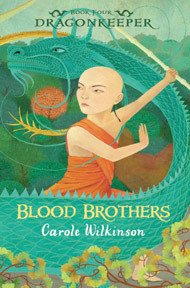 A review copy of Blood Brothers was provided by Walker Books Australia. Celine, I love it when a writer puts you right there in the character’s shoes, so you get to live that life too! Thanks for sharing this thoughtful and beautifully written review with us.